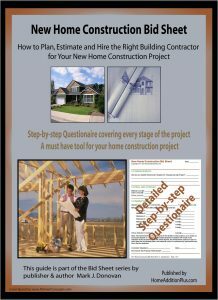 Though not a lawyer I have had my share of experiences with home construction contracts. As a homeowner and as an occasional general contractor, I have negotiated and signed numerous home construction contracts with building contractors and subcontractors for building new homes and home additions. Some of the home construction contracts that I signed were quite comprehensive, and others were short and sweet. Both can be acceptable depending upon the size and scope of the project. Summarized below are a few things to pay attention to when reviewing, negotiating and signing home construction contracts. First, always have a complete set of blueprints or drawings, as well as a separate list of unique specifications for the particular new home construction project. By having this type of documentation the home construction contract can be simplified as it can simply reference the drawings and specifications. Second, it is important that the home construction contract contain start and completion dates. Having a home construction contract that is open ended on either the start or finish date is a recipe for disaster, both in time and money. If the home construction project is large, or involves multiple disciplines make sure that each start and finish date is listed for each phase of the project. Third, do not over pay when it comes to a deposit. It is common for home construction contracts to require a deposit from you, however it should not be for bank rolling the home construction project. Instead it is to show consideration, or earnest interest, in the home construction project. Consequently a home construction contract should not require you to pay more than a 10-15% deposit, and the money should be put into an interest bearing bank account for your benefit. Forth, if the home construction contract specifies incremental payment milestones as construction work is completed, make sure the incremental payments are commensurate with the work being completed. For example, when the home addition has been rough framed in, then an additional payment to the contractor for this completed milestone is reasonable. If, however, the home construction contract calls out for a much higher incremental payment than the cost of the completed phase of the project, challenge the contractor. You already made an earnest commitment with an initial deposit, and again you should not be bank rolling the project. Incremental payments should be sized for the work completed, not for the work to be completed. From personal experience, if you find yourself paying in advance for work to be performed, you may wind up staring at a non-completed home construction project. Ideally you should have the construction contract written in such a way that as much money as possible is held back for the final payment. By doing so, you will help to incentivize the home construction contractor to complete the work to your satisfaction. Finally, if you feel uncomfortable with the home construction contract language, seek a lawyer to review the contract before signing it. Though it may cost you a few dollars, you will save yourself some worry, and potentially a lot of money.